Akah and Claire’s Monday wedding was lit. Let’s rewind the best moments. 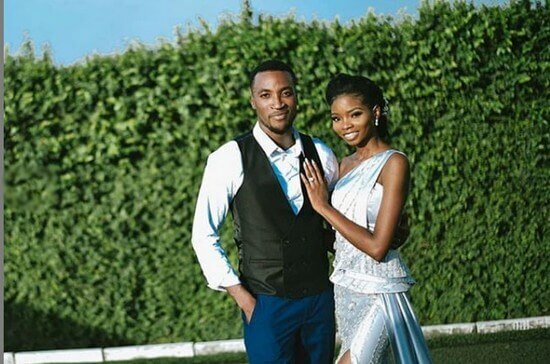 Nollywood actor (Akah Nnani) and Fashion illustrator (Claire Idera) got married last week in a fun-filled beautiful ceremony that included a customary traditional wedding ceremony and a church wedding. Their white wedding was on a Monday (not Saturday), and that didn’t stop their guests and celeb friends from showing up. Now, let’s have a rewind/ recap of our favourite moments from the #AkahandClaire wedding – what they wore, how they partied and more. 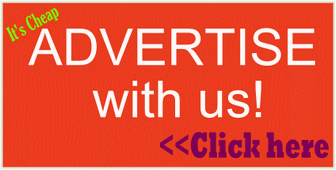 Scroll down to see cute photos and videos from their trad and white wedding. Those two lovebirds broke the tradition that a wedding has to be on a Saturday. They fixed their wedding date on a Monday, and killed it. They made the idea of a weekday wedding stylish and so much fun that you’ll look forward to more weekday weddings. 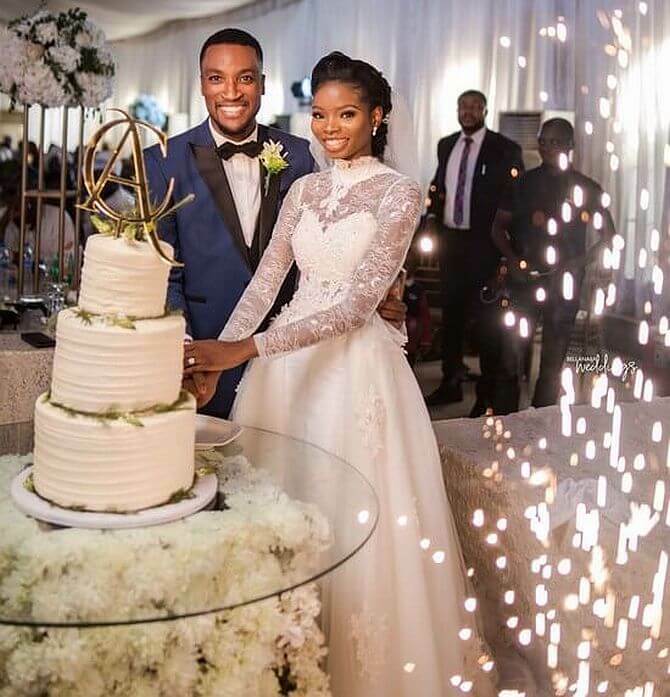 But that’s not the only way Akah and Claire broke Nigerian wedding traditions – they also had a not–too-tall, not flashy cake that looked simple but beautiful. Their wedding cake was a three-step plain cake. It was a tasteful, intimate wedding attended by their family, friends and colleagues. The event exuded an air of a well planned occasion – from their tasteful venue decoration to the bubbly DJ and the live band that kept the groove up. Rapper, M.I., was also there to add spice to the entertainment – and he did a number with Akah backing up to seranade his love. Who knew Akah had a sweet voice (videos are down below). Akah Nnani’s bride wore two wedding dresses – one for the wedding ceremony and a second dress for the reception party. BRIDE’S WEDDING DRESS: Claire’s Cinderella-style wedding gown looked gorgeous on her body shape, as you can see from the above video. The wedding gown was a convertible dress that had a removable train attached at the back of the waistline. In its full form, her wedding gown was a princess-cut dress with illusion sleeves and illusion sweetheart-neckline. The sheer, see-through illusion lace on the top part of her dress extended up to feature a high-neckline style, and also extends down her arms to form long sleeves. Below is a picture of her wedding dress when she detached the train part of the dress (image below) – it transformed into a gorgeous sheath-style wedding gown that looked perfect on her shape. 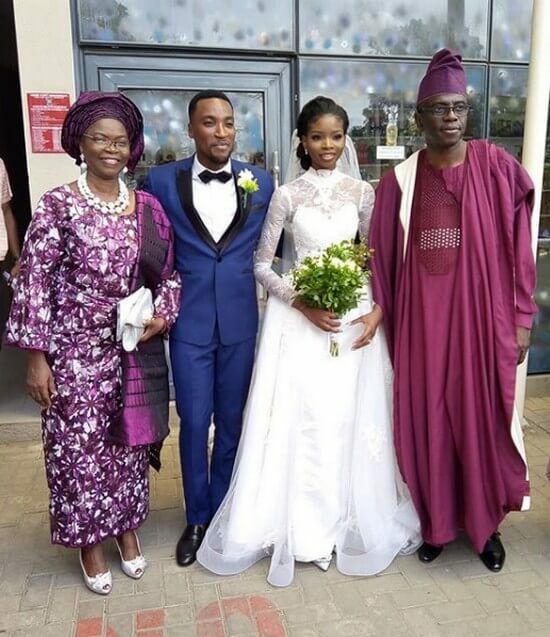 That gorgeous wedding dress was designed by a Nigerian brand, Purple Lagos. Above image is how her wedding dress looks without the detachable train part. GROOM’S ATTIRE: The groom, Akah Nnani, wore a three-piece royal blue tuxedo suit with black shawl-lapel, on a white shirt and black bow tie. There was no dull moment at Akah and Claire’s wedding. They had a great emCee (MC). Their DJ was amazing, live wedding band was on-point, as they got the dance floor kicking. Akah danced so much, and his dance with his mom was the best of the day for us – his mom is a great dancer (videos above). We also loved the dance-off with Chef Fregz. Also on ground to add more spice to the entertainment was rapper M.I. The wedding hall decor was on-point, and it tied every element together. Thumbs up to the wedding planner and team of vendors – #akahandclaire wedding was a huge success. Yay to Weekday Nigerian Weddings! Those pair, Akah and Claire, have taught us that weekday weddings can be as equally beautiful as the traditional Naija weekend wedding parties. Here’s wishing the couple a life of happiness together, and a house-full of beautiful children. By the way, the couple shared their ‘how we met’on Youtube. Hmm… I see Akah and Claire’s Monday wedding sparking off a trend of weekday weddings in Nigeria. We shared that idea in our posts about practical ideas to keep your wedding guest low and save costs without looking cheap (because some peeps can’t leave office for a weekday wedding, and you’ll succeed to keep your food and drinks budget low..
We can’t wait to see more weekday weddings among Nigerian couples who are currently in the wedding-planning stage, especially since it’ll save you money (becuase some fancy, upscale receptions venues are cheaper during weekdays when they are in less demand for events). That’s all on how it went down at Akah Nnani and Claire’s Monday wedding. Hope you like the recap, their beautiful wedding photos and videos. Comment below to tell me the best part of their wedding. 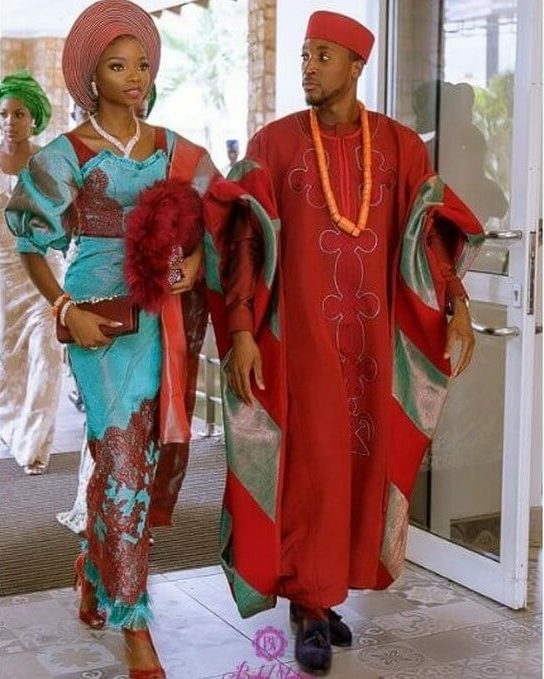 Also, tell me – would you consider having a weekday Nigerian wedding like Akah Nnani and Claire?